Williston entered the St. Sebastian’s tournament looking to bounce back after a two-game losing streak but it was not to happen tonight. The Wildcats were unable to mount much of an offense in the fifty-minute game and lost 3-0. Penalties once again hurt Williston as they were called for four infractions with three coming in the second half of the game. Albany was able to capitalize on one of their chances. Williston was on the power play for only two minutes of the game and never really mounted much of an attack. For a team that was looking to take off from their dominant third period against Canterbury on Wednesday afternoon, Williston just didn’t bring it today. They will have a chance at redemption tomorrow morning at 11 at St. Sebastians when they take on The Winchendon Wapitis who dropped a 5-1 decision to the host school. In the first, Shaul Mitton would get the Wildcats on the board at the 10:27 mark when he blocked a shot from the point, drove down the right wing and let a shot go from the right dot beating Gunnery goalie, JP Mella. The lead only lasted for just under three minutes when Gunnery’s Jimmy Rayhill entered the Williston zone and let a shot go that hit the left post and deflected in; Williston goalie Trevor Corsello was screened on the play and couldn’t make the save. The teams entered the dressing room after one period, 1-1. In the second, Gunnery took the lead at the 3:39 mark. The game would stay like that for over eleven minutes until Williston put a puck deep into the Gunnery zone when a hard-working and tenacious Jack Purcell skated like the Chicago wind, wrestled the puck away from a Gunnery defenseman, and whipped a pass through the crease to junior Matt Pimental who got a stick on the puck and tipped it past Mella. It was a pretty goal that tied the game. In the third, below average play in the defensive zone allowed for Gunnery to get two greasy goals to solidify the win. The winning goalie made 22/24 saves, while Corsello made 33/37 saves. One Wednesday, the win-less Canterbury Saints came marching into town looking to the heavens for some inspiration and a win. They got it, taking the matchup, 4-2. There was no scoring in the first period and while Williston was outshot 11-4, both teams were about even in their play. In the second, Canterbury took the lead just nine seconds into the period. They got three more to take a huge 4-0 lead going into the third. In the third, Williston outright dominated Canterbury, outshooting them 23-2. A countless number of those shots just missed the twine or slid slowly across the crease and into the corner; pucks just were not just falling for the Wildcats. Then, at the 11:21 mark, Jack Purcell let a rip go from the right dot on the power play. Assists went to Cam Mariani and James Belleavoine. Purcell’s energy looked to get the Wildcats going even more as their pressure mounted on Canterbury. Then, captain Tim Rego took a pass from Shaul Mitton in the high slot on a 6×5, wove his way through a myriad of Saints’ players and shuffled off to Buffalo with a nifty backhander at the 16:59 mark of the period. But that was all Williston would garner in the period. Williston’s Kyler Breland took the loss saving 20/24 shots while Cal Skwara saved 39/41. Williston’s effort in the third period was the best of the season and showed that if they can do that for a whole game, they will be tough to play against and beat. Williston now heads into the holiday break and the St. Sebastian’s tournament. Last year they entered the tournament 2-2 due to a Gunnery game that was cancelled to snow and the fact that they played Canterbury after New Year’s, so while they are sitting at 2-4, last year at this time they had only garnered two wins so fans should not lose hope. Williston will leave early Friday afternoon where they will play in the St. Sebastian’s Holiday Tournament in Needham, MA. The Wildcats will open the tournament at 4pm against a tough Albany Academy Cadets’ team. The winner/loser will play the winner/loser of the St. Sebastian’s/Winchendon game the following day. The rest of the field includes Canadian powerhouse St. Andrews School, New York’s Adirondack prep school, the Northwood School, last year’s Large School Tournament Champion, Brunswick School, and a very strong Rivers School. See you there! The Williston Wildcats traveled to Cushing on Wednesday afternoon to do battle with the Penguins at Iorio Arena. While Williston battled hard, they did not play a full 54-minute game letting lapses in the defensive zone put them on the wrong side of a 4-3 game. James Belleavoine got the Wildcats on the board in the first period when Shaul Mitton drove down the slot, let a shot go which was saved by Cushing goalie Joe Sharib, a Union recruit; Sharib made the save but Belleavoine was there to drive home a rebound at the 12:50 mark. Alex Berg got the other helper. In the second, Cushing tied the game on a power play and then went up at the 13:45 mark of the period. Mitton would tie the game on the power play when he drove hard to the crease and tipped in a hard pass from d-man Tyler Varin. Cushing would get another that period but with .03 seconds remaining in the period and with the goalie pulled, Brendan Nehmer put a puck past Sharib off a faceoff to knot the game at threes. Cushing would take the lead and the game in the third with 5:55 remaining on the power play. Williston battled, and hit the post two times in the remaining minutes but could not even the score. Williston played hard and came close but did not play as hard as they needed to in the defensive zone. Sharib earned the win making 22 saves; Kyler Breland took the loss for Williston making 30 saves. On Friday night, Quebec City’s Académie St. Louis entered Lossone to take on the Wildcats. Williston took the cheese in this one, 5-1 bringing them to .500 on the season. Williston got on the board just 34 seconds into the frame when ASL took a penalty at :07 mark on a hit from behind. On the power play, off a shot from Jake Sacratini, James Belleavoine put in a hard-fought rebound. Tim Rego got the other assist. Then, a little more than two minutes later, Jake Sacratini got his first goal of his Williston career making it 2-0 when he drove hard to the net and caught a pass from Rego and made good on the opportunity. Tyler Varin also earned his first of the year when he let a shot go from inside the blue that was too much for ASL goalie Emile Savoie. Assists went to Hunter Sarro and Hunter Wilson. ASL got off the schneid at the 13:27 mark on an errant play behind the net by two Williston defensemen. The ‘Cats went into the dressing room after one period up, 3-1. In the second, Shaul Mitton garnered the fourth Williston goal at the :21 mark of the game when he let a shot go from the slot beating Savoie on the far post. Tommy Harty and David Novotny earned the assists. Then at the 13:11 mark, the line earned the Kodak moment of the game when Mitton took the puck at the red line and made a short two-foot pass to Novotny who blazed into the left side of the ASL zone and then slowed down waiting to hit a trailing Harty in the high slot. Harty took advantage of the time and space created and buried his first goal of the season. In the third, Williston worked to maintain the lead and when the buzzer sounded Williston won and the bell would be rung. Trevor Corsello earned the win saving 16 shots. Williston outshot Académie St. Louis, 47-17. The game puck went to Tyler Varin for his first goal and continued consistent and smooth play. Tonight your Wildcats welcome The Gunnery School Highlanders to Lossone for a 6 o’clock tilt. If you need a break from shopping and spreading holiday cheer, stop by the ol’ hockey barn for a much-anticipated game! On Saturday evening, the number 1-ranked Salisbury Scarlet Knights entered Lossone Arena and dropped Williston 4-1. While Williston put up a solid fight in the first period, the eleven current Division I commitments and the rest of their teammates were too much for the Wildcats who appeared to peter out at times during the matchup. The game started with excellent pace as both teams worked hard to establish early momentum that would hopefully carry their club through the entire fifty-four minutes. One fan commented early on in disbelief that the game was so hard-hitting and fast. While Salisbury mounted substantial offense at times, Williston goalie Trevor Corsello was up to the task making many excellent saves. At the other end, new junior Nicholas Haas was tested early and often as well. Williston got on the board first at the 7:38 mark of the period when Jake Sacratini was able to break up a Salisbury offensive zone opportunity at the blue line allowing his linemate Cam Mariani to gather the puck and streak in to the Salisbury zone with Brendan Nehmer driving hard to the net. Forgoing a pass, Mariani let a rip go from the right dot beating Haas far side. Williston took a 1-0 lead into the dressing room after one period of play. In the second, penalties and lack-luster efforts by the Wildcats led to three Salisbury goals, including the third on a breakaway by Nick Capone for a short-handed try. Salisbury went into the second intermission, 3-1. In the third, Salisbury iced the game at the 2:05 mark when Capone earned his second goal of the game. Williston battled but Salisbury had too much depth. Corsello made 25 saves on the day while Haas made 26. Williston looks to rebound with a three-game week. On Wednesday, Williston makes the hour-and-a-half trip to Ashburnham, MA to take on the #5-ranked Penguins of Cushing at 3:30, a team that they have not beaten in many tries. On Friday, Williston is back home to take on Academie Saint-Louis at 5:30 and then #7 Gunnery on Saturday at 6. Great seats are still available for both home games and offer a great environment for family and friends. See you there. 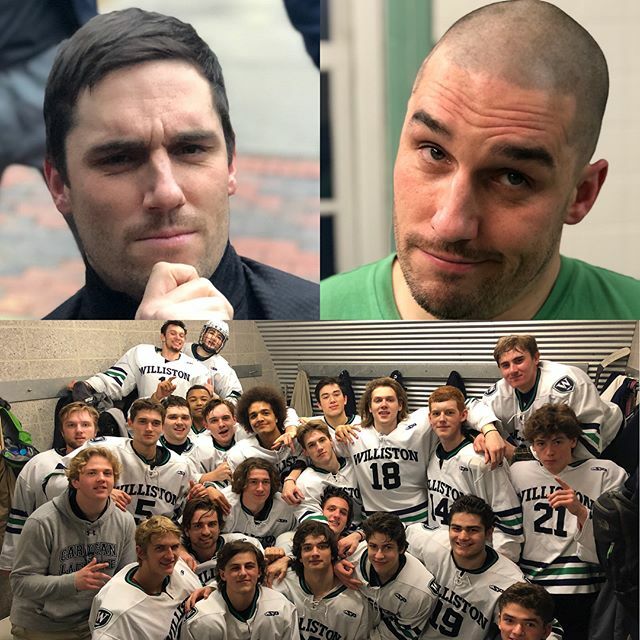 Williston opened the 2018-2019 season in style, beating the #11th ranked Avon Old Farms Winged Beavers on the road, 5-2. The matchup saw an array of new faces on the ice as graduation and underclassmen defections took its toll on both clubs in the offseason. On this day, it was the Wildcats who were able to find their identity and take the win. Avon got on the board first at the 3:53 mark in the first period as forward Tim Heinke took a pass from winger, John Turner, and single-handedly entered the zone, split the Williston defense, and tucked in a nifty goal past new Williston goalie Kyler Breland from Drayton Valley, Alberta. The lead would not last however. Fielding a dump-in behind the net, Avon goalie Alex Aslanidis (a Providence recruit) was outworked for a puck by new junior Shaul (pronounced SHOW-el) Mitton of Charlottetown, Prince Edward Island, who used his big 6’2, 175 frame to disrupt the play, gather the puck and make a pass from behind the left side of the net to returning (and wide open) sophomore David Novotny (Boca Raton, Florida) in the low slot who fired a low shot in the right corner tying the game at 1-1 at the 6:35 mark. Senior Captain Tim Rego (Mansfield, MA) would break the tie on the power play at the 8:19 mark of the period when Hunter Sarro (North Attleboro, MA) worked hard in the corner for a puck, made a quick pass to Rego at the left point who let a quick rip go beating Aslanidis. Williston arms went up; Avon heads went down. The lead was short-lived as Avon tied the game on a goal from John Tuner with assists to Nick Cyprian and Tyler Boucher in a scrum in front of Breland at the 10:50 mark. Williston would take the lead for good at 16:37 when the pride of Western Mass and post-graduate from Pope Francis, Brendan Nehmer (East Longmeadow, MA) would net the first goal of his career on a shot from the slot that beat Aslanidis over the shoulder. Williston would enter the dressing room at the end of one, 3-2. The second period was riddled with penalties including 5x3s for both squads. The first of the two was successfully killed off by an incredibly stingy Williston penalty kill unit. Within thirty seconds of the final penalty expiring, David Novotny collected a puck at his own blue line and drove down the ice on a 2 on 1 with new junior Tommy Harty (Billerica, MA) streaking toward the goal. Novotny looked off Harty and blasted a shot past Aslanidis for the fourth Williston goal and his second of the game. An interesting note is that last year as a freshman, Novotny did not see any time in the Avon game because the coaching staff did not feel he was “ready.” My, how a year can change things! In the third period, Williston put the screws to Avon and did not allow any grade-A chances. Breland saw almost every shot and was up to the task on every Avon opportunity. You could see the Winged Beavers frustration because they could never get anything going offensively. Meanwhile, Williston put the final nail in the metaphorical coffin when senior Cam Mariani (Wilbraham, MA) took a pass from newcomer Jake Sacratini out of the left corner and let a low blast go; Aslanidis made a beauty kick save that landed on the stick of Nehmer in the slot who buried the puck into an open net for his second goal, solidifying the win. Avon had some good opportunities late but could not bury chances. When zeros hit the scoreboard, Williston took the win, 5-2. The game puck went to Breland for his stellar play in goal and being the steady pillar the Wildcats needed, making 41 saves on the day. Aslanidis saved 26 of Williston’s 31 shots. This year, the Wildcats return only seven players from last year’s playoff-bound club. Breland’s partner in nets is junior Trevor Corsello from Seldon, NY on Long Island. Returning on defense with Rego is Alex Berg from Tampa Florida who has picked up where he left off last year as the steady, stalwart defenseman. Williston fans will notice the name Hansen on the blue line and may wonder if former Williston forward Brendan Hansen shot up six inches over the summer and switched positions. In fact, Hansen is playing at the University of Colorado at Boulder, while his younger brother Mitchell takes the reigns to live on the family name in Easthampton. New sophomore defensemen include Hunter Wilson of Westport, CT; Tyler Varin from Smithfield, RI; and Zac Gmerek from the greatest little city east of the Mississippi, Rochester, NY. At forward, Williston returns five players. Seniors Cam Mariani, Hunter Sarro, and James Belleavoine (Smithfield, RI) look to carry some of the Williston scoring load this year and already have proven how much a year can change a player, while Sophomores David Novotny and Brandon Barrett (West Palm, FL) look to be contributors as well. The Williston faithful will also notice a number of new faces on offense this year. Along with Nehmer, post-grad Jack Purcell of Chicago, Il has already shown his worth with excellent penalty killing and leadership. The junior class will be well-represented with the likes of not only Mitton, Sacratini, and Harty, but also the workhorse and Portuguese Power, Matt Pimental from East Providence, RI. Sophomore Richard Stefanik (Whitehouse Station, NJ) rounds out the sophomore class and looks to hone his craft for the Lossone fans. Behind the scenes of this year’s operation, the team will be in the hands of our willing and capable managers, senior Ethan Bradway (media and tech engineer) and sophomores Oscar Nguyen (hydration and statistics extraordinaire) and Lucas Boyd (sound and hype man). The Wildcats will be led by 13-year coach, Derek Cunha. Dave Cunningham will be working with the defense and goalies while Kyle Hanford will try to harness the forwards. Williston is back in action on Saturday night at 5 o’clock as the Salisbury Scarlet Knights come to town. Salisbury is a perennial power and is ranked number #1 in New England this year. Great seats are still available, so bring the family down for an exciting night of hockey.